Life has been crazy busy here lately, and I have totally unintentionally abandoned my blog as a result....I PROMISE to start writing again this week!! Please don't give up on me!!! I love you all! :D I hope everyone had a great Thanksgiving! Time to find out who won the Giraffalaff Limbo and Scatterpillar Scramble giveaway!!!! Even though we got 2 games in the mail, we decided to do one a night. We started with Giraffalaff Limbo. First thing to note is that the game requires 3 AAA batteries which are not included. Assembly was very smooth and straightforward. The only tool required was a phillips head screwdriver to unscrew the battery door. It should be noted that after assembling the side supports of the game, they do not come apart to fit back into the box. 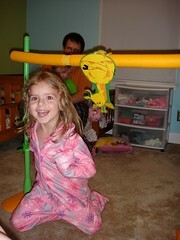 When assembled, the game consists of the two side supports, the horizontal limbo bar, and a spinner card. Each round, someone spins, and whatever method the spinner lands on (limbo, crab walk, bird walk, etc) is the method for that round. 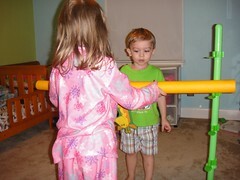 Everyone has a turn, and whoever knocks the bar off of the supports is out. Then the winners of that round get to try another round, but with the bar moved down a notch. My kids (4 and 2.5) were most interested in spinning the spinner, so we kind of made our own rules as we went. We kept the bar at the highest, and just let them keep going with no winners or losers. 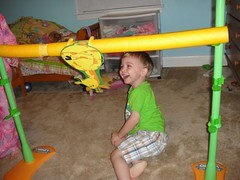 Giraffalaff Limbo can be purchased at most toy retailers including Amazon.com, Toys R Us, Target, etc. NOW for the REALLY fun part....if you don't want to buy it, you could win it!! Myblogspark.com and Hasbro have generously given me the opportunity to give away Giraffalaff Limbo and Scatterpillar Scramble!! Be sure to leave a separate comment for each entry. The giveaway will run through 11:59pm eastern November 11. The winner will be chosen using random.org, and announced November 12. Entry 1 - Leave a comment and answer this What was your favorite game growing up? *The products for this review were provided by myblogspark.comand Hasbro, however I was in no other way compensated for this review. All of the opinions are honest, and belong to me.